Throughout his eight-year papacy, Pope Benedict XVI has “carried out a cleansing of the episcopate,” said the apostolic nuncio to Kazakhstan, Kyrgyzstan and Tadjikistan. “This Pope has removed two or three bishops per month throughout the world because either the accounts in their dioceses were a mess or their discipline was a disaster,” said Archbishop Miguel Maury Buendia during a Feb. 20 address at the University of San Pablo in Madrid. Nearly all of these bishops, when approached by the Pope’s representative, were aware of the “disaster” and accepted the request to resign, he added. The archbishop went on to say that he was “surprised” by the Pope’s decision to resign but said it is an example for the world’s politicians who hold on to power as long as they can. The Holy Father’s decision is something that “great men have always done,” he noted. Archbishop Buendia said he was aware that the Pope was wearing himself out and had wondered how he would be able to make the trip to Brazil this summer for World Youth Day, but his decision to resign was unexpected. Not only has he been “cleaning up” the espiscopate by requesting resignations, CNS reports that there has been a 19 new appointments in the last eighteen days. So, it is a private joy of mine to observe some of the arguements among the teens within our youth group. A few weeks ago, the subject was the date of the Solemnity of the Incarnation (Thanks for the correction Fr. Schierer!) Nativity of Our Lord (Christmas for those who are unaware of the correct name) and how it was chosen. It seems that the theological urban legend of Saturnalia is right now at the forefront. Unfortunately, that would not be correct albeit a very popular theory. Dr. Taylor Marshall at the Cantebury Tales blog wrote on the subject so beautifully and thoroughly that I thought he should say it. Please, oh please, will all the catechists out there teach your students correctly? December 25 is the historical date for the birth of our Lord. In two previous posts, we examined how the Bible indicates that Christ was born in late December and how Mary and the Apostolic tradition prior to Constantine confirm December 25 as the historical date of Christ’s birth at Bethlehem. Today we turn to our present Holy Father, Pope Benedict XVI. On pages 107-108, Cardinal Ratzinger makes the observation that the day of Christ’s death was also reckoned as the day he was conceived by the Holy Ghost in the womb of the Blessed Virgin Mary. March 25, then was the annunciation of Gabriel. Add nine months to that and you arrive at December 25 as His birthday. Ratzinger then dismisses what he calls “these old theories” that teach that December 25 was chosen to cover over pagan holidays. Rather, the Holy Father recognizes December 25 as the true birthday of Christ the Lord. He expands that this alignment of meanings has liturgical significance. Also, Pope Benedict XIV argued in 1761 that the church fathers would have known the correct date of birth from Roman census records. The cosmic character of liturgical music stands in opposition to the two [prevailing] tendencies of the modern age…music as pure subjectivity, [and] as the expression of mere will. We sing with the angels. Cardinal Ratzinger wrote these words in his book, The Spirit of the Liturgy. The pontificate of Pope Benedict XVI has once again placed Liturgy at the centre of the Church’s concerns, and rightly so, for as the then Cardinal wrote in 1997, the true celebration of the Sacred Liturgy is the centre of any renewal of the Church whatever. There can be no doubt that we are currently in the midst of a period of great change in the Church. We are also in a crisis in terms of the Music of the Church. Despite the numerous documents to come out of Rome, both before and after Vatican II, despite the call of the Holy Father to raise the standards of liturgical celebration, despite the restoration of the Chant, largely undertaken by the Monks of Solesmes in the late 19th century, work that still continues today. Despite the fact that the Monks of Heiliger Kreuz Monastery in Austria have been at the number one slot in the charts for months, with their disc of Gregorian Chant. Despite the efforts of notable Catholic musicians who, in may cases, feel reluctantly compelled to work for other, separated brethren because the feel they are fighting a losing battle with the Catholic Church. Despite the many places where choirs exist and are being created to help rediscover the riches of liturgical music which is the Church’s inheritance, and the wealth of new music being written by talented composers in the service of the church. Despite the fact that the monasteries, institutes and congregations which have restored traditional liturgy and chant are gradually filling up once more, whilst many other communities sadly dwindle and die. In spite of all this, we still will not accept that music in the liturgy is not offered for us, but to God, and must therefore be of the very highest quality that we can muster, both in terms of its composition and its performance, and that the faithful are remarkably receptive to good music, when they are fortunate enough to hear it and, better still, sing it! That is not so say that old music is good and that anything that has been written for the liturgy following the Council is bad. However, the general view of the clergy seems to imply the reverse – that all pre-conciliar music is ‘old hat’ and irrelevant, and that the only music that truly ‘speaks’ to the people of God and draws them into the liturgy is the contemporary ‘popular’ music which we hear in most parishes across the world. Music is inextricably linked to the Liturgy and, as we are reminded by the Holy Father, that music be of the best possible quality. Of course, this leads us into the realms of what is to be considered ‘good’, as well as the purpose and effect of music. Is music, including liturgical music, adequately treated when it is left as simply a matter of ‘taste’, of individual response to what pleases? Music is about formation, and not just expression. A constant theme across the centuries is the balance of the need for contemporary musical expression with the responsibility of using music that will truly “sanctify the faithful”. Music should enhance the formative power of the liturgy already represented by the celebration of Holy Mass. the sanctification and edification of the faithful. The ‘chief duty’ of church music is, he goes on to say to clothe the liturgical text, which is presented to the understanding of the faithful, with suitable melody; its object is to make the text more efficacious, so that the faithful through this means may be more roused to devotion, and better disposed to gather to themselves the fruits of grace which come from the celebration of the sacred mysteries. One of the most shamefully ignored aspects of Sacrosanctum Concilium was its acknowledgement of ‘Gregorian chant as proper to the Roman liturgy’, and thereby having pride of place in liturgical music. Just ten years before the Council began, the French Dominican, Dominique Delalande wrote a theology of the Chant. I am indebted, here, to an excellent talk given by Aidan Nicholls at the Catholic Directors of Music Conference last year for his summary of Delalande’s work. In his book, Delalande called the chant a ‘given’, which theologians must integrate with their work. The structure and ethos of the Church’s official prayer – the Mass and the Liturgy of the Hours – cannot be fully grasped, he wrote, without reference to the music that accompanies it. 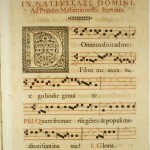 In the case of the Roman Liturgy, that music is Gregorian chant, though, as he explained, the Eastern liturgies possess some analogue of Western plainchant – a monodic music, archaic, pure, with a solemn, sacral character, a consecrated music whose origins are lost in immemorial time, but existing, it may be, alongside a more developed or a more popular music, generally of highly questionable value. Delalande reminds us of the multiple sources of the chant – Jewish, Syrian, Greek –as well as the anonymity with which composers of genius re-worked its materials at various stages of its long history. Delalande calls this a providential anonymity, which enables us to say the more readily: this music comes from the Church as Bride of Christ, assisted by the Holy Spirit. In his controversial but fascinating book The Bugnini Liturgy and the Reform of the Reform, the Hungarian musicologist and liturgist Lázló Dobszay laments the loss of the Chant in the liturgy of the post-conciliar church. One of his most frequent objections to much post-Vatican II liturgical practice is that attempts to set antiphon texts for the Novus Ordo has given way to what he terms ‘insertion music’ ie strophic hymns, or has contented itself with settings that cannot of their nature bring out the full meaning of the Scriptures. Perhaps increased celebration of the Missa Cantata in the now commonly know as Gregorian Rite encouraged by the motu proprio Summorum Pontificum will remind the faithful that the chant has for centuries successfully and beautifully rendered vocal the precise texts of the liturgical books. 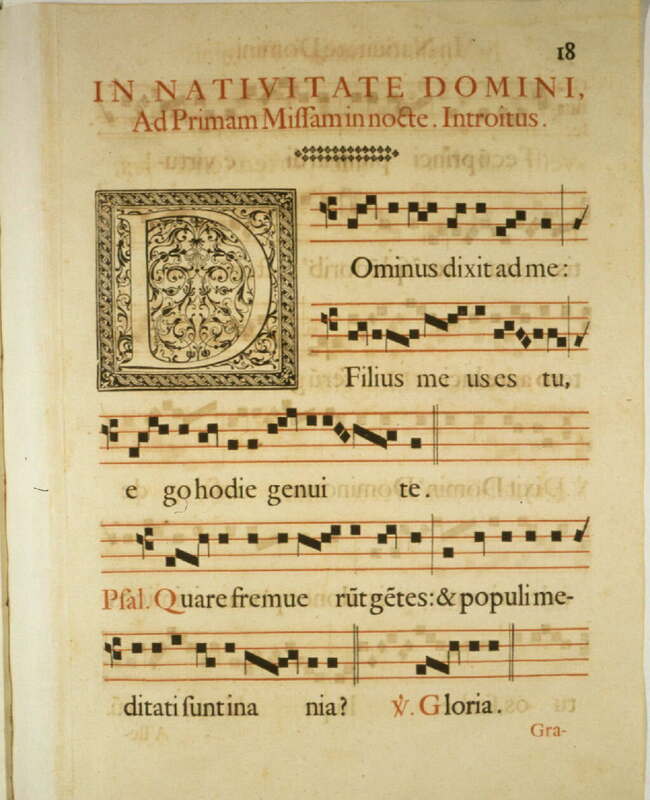 Nor should the complexity of the chants of the Graduale put people off – the Graduale Simplex (for the Novus Ordo), the Chants abrégés (a wonderful resource containing simplified chants for the Gradual, Alleluia and Tract) and even the Rossini propers allow even the most modest choir to sing the proper texts of the Mass in either ordinary or extraordinary form. The Church Music Association of America’s spectacular website provides us with every possible resource to achieve this, and all free of charge – I commend to you a thorough exploration of the resources available through www.musicasacra.com. Moving away from the Chant and more towards the general situation of church music in the present day, we find a contradiction between the Church’s historic practice and the present day preference for what Dobszay terms ‘utility music’, whose usefulness at the Liturgy consists in encouraging vocal participation by the people however minimal the artistic standards of the music concerned. This brings up the much-debated question of the nature of participation – the conciliar ACTUAL participation, and the mistranslation often used to justify such impoverished musical contributions – ACTIVE participation. Such a deliberately misguided interpretation of the aims of the Second Vatican Council has given us the increasingly grim impoverishment which follows when beauty for its own sake is banished from the Church. Of course, Gregorian Chant is not the only music of the Roman Rite. Sacrosanctum Concilium reminds us also of the wealth and beauty of the polyphonic repertoire, and of the need for new generations of composers to work in the service of the Liturgy. The contemporary composer of sacred music in the wake of the Council has phenomenal possibilities, but always in continuity with the best of tradition – as the council fathers remind us, the contemporary composer of sacred music is not working alone, in isolation, but at the end of a long line of liturgical musicians stretching back through Bruckner, Mozart, Byrd, Gombert and the medieval chant-writers whose names we know not. So where does this leave us now? We are faced with dwindling numbers attending Mass on a regular basis. We are faced with rapidly emptying convents, monasteries and religious houses. We are faced with dwindling vocations to the secular priesthood – back home in Southwark we are fortunate to be sending eight seminarians to study this year. However, in Wales, where I grew up, a Benedictine friend of mine informs me that there has not had a successful vocation to the Archdiocese of Cardiff for five years. The same can be said for several other dioceses across the UK. We are we are faced with a society that neither know nor cares about God. However, it is worth pointing out some positive facts. Some of the newer monastic foundations, notably in France, are flourishing – I refer mainly to those institutions which have revived the Missal of 1962 and restored the Latin Office. Le Barroux (and its foundation), Notre Dame de Fontgombault, Notre Dame de Randol, Notre Dame de Triors and the Canons Regular of Lagrasse. The FSSP, the Institute of Christ the King and the Institute of St Philip Neri in Berlin are also flourishing. The Monastery of Solesmes, which has an exclusively Latin, Gregorian Liturgy, in their case rooted in the Novus Ordo, does not lack vocations. The Oxford Oratory, after having been forced to turn away vocations for years due to a lack of space, is now building a new wing so as to take on some of the many young men who wish to give their lives in the service of God through the Oratory of St Philip Neri. The recent renaissance in the Liturgy, brought about largely by Summorum pontificum, has also healed schism, in the case of the Transalpine Redemptorists, and has thrown open new windows for dialogue between the Church and separated groups such as the SSPX, the members of which are currently anticipating a lifting of their excommunication following that of their bishops in yet another generous gesture from our Holy Father. There has been a recent spate of interest in Gregorian Chant, with workshops all over the UK and the US, not to mention non-English speaking countries, and new choirs being established, full of young men and women eager to embrace music which challenges and stretches them, which is both educating and edifying, and which gives glory to Almighty God. I have been fortunate enough to combine my work at the Cathedral with teaching at the London Oratory School, a post I held for 7 years. The boys there are taught the Chant from the age of seven, and they sing their paternoster and their Marian antiphons with gusto, as well as their classical masses, Palestrina motets and newly-composed works written for the post-conciliar liturgy by composers such as James MacMillan and Roxanna Panufnik. The Music Department is staffed by a dedicated team of professional musicians, under the leadership of Lee Ward, who also directs the famous London Oratory School Schola, and the School is leading the way among Catholic Schools in the teaching of liturgical music to boys and girls of all ages and abilities. The pupils are not interested in passing musical fads, in liturgical imitations of music that their parents once danced to in the 70s and 80s! Children, more than any of us perhaps, are only too well aware of what is passing, and what is timeless. They recognise and appreciate quality. They understand when they are being stretched and when they are being led to an understanding and appreciation of something truly great. Young people know when they are being patronised, when things are dumbed-down, and when people of previous generations try to ‘get down to their level’ by eschewing quality and artistic merit in favour of pop-like ditties in order to encourage them back to Mass. It is these children who are the future of the Church, and it is our duty to bequeath to them an understanding and appreciation of the power of real church music to lead people to God. I spoke earlier of the renewal of the liturgy in various religious houses and congregations. This renewal in the liturgy is inseparable from a renewal in liturgical music. Perhaps more than any other art form, music is able to both clothe the Liturgy and reach the hearts of the faithful in a unique way. The Church recognises this fact, and has emphasised it throughout Her history, up to, including and beyond the Second Vatican Council. We ignore her teaching at our peril. There is a new mood within the world of professional church musicians in the years following the election of our Sovereign Pontiff. His love for the liturgy and music, and his recent pronouncements, have given us hope and encouragement. 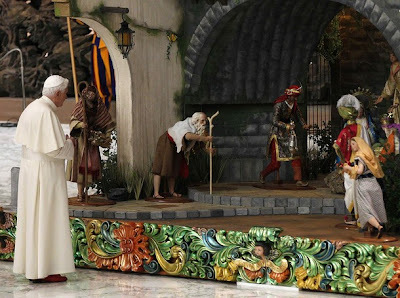 The renewed interest in the Chant is spreading to the parishes and the schools, and the renewed interest and celebration of the Usus antiquior is, as the Holy Father intended, beginning to have an effect on the celebration of the Novus Ordo, and vice versa. I have been asked to speak to the CCDM (Catholic Cathedral Directors of Music Conference) in Salford this year and to direct chant classes for them – in response to this renewed interest in the Chant. The musical provision for the Usus antiquior was also the topic for an enlightened homily given at the last CCDM conference in Liverpool by a priest of the Metropolitan Cathedral. This is all very positive indeed. The new liturgical texts prepared by ICEL present us with a unique opportunity – that of being able to discard vast numbers of, frankly, shoddy, banal settings, and has given composers the chance to look, once again, at settings of the Mass. The new texts have a poetry lacking in the last translation, and lend themselves more easily and fluently to musical setting. The recent proclamation concerning the use of the tetragrammaton will remove from the hymn repertoire various liturgical songs of questionable theological, musical and poetic substance, and the Church’s keenness that we should begin to use the proper antiphon texts, in place of strophic hymns, will not only please Mr Dobszay, but give composers a fresh opportunity to look at those parts of the Mass which have been so shamefully ignored for the past 30 years. It is also worth noting at this point that Dobszay is currently working on an ‘English Gradual’, with assistance from many of my fellow UK Catholic Church musicians – I look forward to seeing the fruits of their labours, though I remain sceptical as to the setting of vernacular text to a Gregorian repertoire so intrinsically linked to the Latin text for which it was created. I make no apology when I say that I hope that the years of experimental liturgy and music are over, and that we can, as the Holy Father wishes, return to a more dignified, solemn celebration of Holy Mass and begin, once more, to offer music that is worthy of the worship of Almighty God, who has given us this great gift in order that we might glorify Him. St Augustine reminds us Qui cantat, bis orat; he who sings prays twice. I hope that henceforth our prayers will include the development of music in our monasteries and convents, in our parishes, cathedrals and schools, and the musicians who are working so hard in order to facilitate good musical practice for the glory of God. And for vocations to our convents and monasteries – may our music lead people to a greater knowledge and love of God. and what we believe in our hearts we may practise and show forth in our daily lives. Through Christ our Lord, Amen. Ss Gregory and Cecilia, pray for us. We consider it our duty to reaffirm that the remuneration of work is not something that can be left to the laws of the marketplace; nor should it be a decision left to the will of the more powerful. It must be determined in accordance with justice and equity; which means that workers must be paid a wage which allows them to live a truly human life and to fulfill their family obligations in a worthy manner. Other factors too enter into the assessment of a just wage: namely, the effective contribution which each individual makes to the economic effort, the financial state of the company for which he works, the requirements of the general good of the particular country … and finally the requirements of the common good of the universal family of nations…. But above all we must remember the priority of labor over capital: labor is the cause of production; capital, or the means of production, is its mere instrument or tool. It is right to struggle against an unjust economic system that does not uphold the priority of the human being over capital and land. The capital at the disposal of management is in part the product of the labor of those who have toiled in the company over the years, including currently employed workers. As a minimum, workers have a right to be informed in advance when such decisions are under consideration, a right to negotiate with management about possible alternatives, and a right to fair compensation and assistance with retraining and relocation expenses should these be necessary. Since even these minimal rights are jeopardized without collective negotiation, industrial cooperation requires a strong role for labor unions in our changing economy. Here are some more links on Catholic Social Teaching. If you want to know what is really going on during a liturgy, you need to talk to the Master of Ceremonies. The Emcee assists the celebrant in orchestrating the liturgy in such a way that those who participate are drawn in to the mystery of the Feast of Divine Love. So, what if the celebrant is the Pope? The actions of the Emcee expresses the mind of the Church through the interpretation of the celebrant. Some might say that liturgical interpretation is wrong. But let’s be honest, how something is said, gestured, and/or expressed must pass through a person who lives during a particular time that has formed his ars celebrandi. Check it out, some great answers in the interview and possibly a view into the Holy Father’s liturgical mind. Thanks New Liturgical Movement. The following interview with Msgr. Guido Marini, papal master of ceremonies, appeared the Polish Sunday Catholic Weekly online. Wlodzimierz Redzioch: – What does the collaboration between Benedict XVI and his Master of Ceremonies look like? Does the Pope decide about everything? Msgr. Guido Marini: – At first, I would like to stress that the celebrations the Holy Father presides over are to be the points of reference for the whole Church. The Pope is the highest priest, the one who offers the sacrifice of the Church, the one who shows the liturgical teaching through celebrations – the point of reference for all. Considering this explanation it is easier to understand what the style of collaboration between the Papal Master of Ceremonies and the Holy Father should be. One should act in the way to make the papal liturgies the expressions of his authentic liturgical orientation. Therefore, the Papal Master of Ceremonies must be a humble and faithful servant of the liturgy of the Church. I have understood my work in the Office of Papal Liturgical Celebrations in this way since the very beginning. – Why is it so important that the Church preserves using Latin in the liturgy? – Although the Second Vatican Council introduced national languages it recommended using Latin in the liturgy. I think it is for two reasons that we should not give up Latin. Above all, we have a great liturgical legacy of Latin: from the Gregorian chant to polyphony as well as ‘testi venerandi’ (sacred texts) that Christians have used for ages. Besides, Latin allows us to show catholicity and universality of the Church. We can experience this universality in a unique way in St Peter’s Basilica and during other international gatherings when men and women from all continents, nationalities, languages, sing and pray in the same language. Who will not feel at home when being at church abroad can join his/her brothers in the faith at least in some parts by using Latin? – Do you agree that the faith of priest is expressed in the liturgy in a special way? – I have no doubts about it. Since the liturgy is the celebration of Christ’s mystery here and now the priest is called to express his faith in a twofold way. Firstly, he should celebrate with eyes of the one that looks beyond the visible reality to ‘touch’ what is invisible, i.e. God’s presence and work. It is ‘ars celebrandi’ (art of celebration) that lets the faithful check whether the liturgy is only a performance, spectacle for the priest or whether it is a vivid and attractive relation with Christ’s mystery. Secondly, after the celebration the priest is renewed and ready to follow what he has experienced, i.e. make his life a celebration of Christ’s mystery. 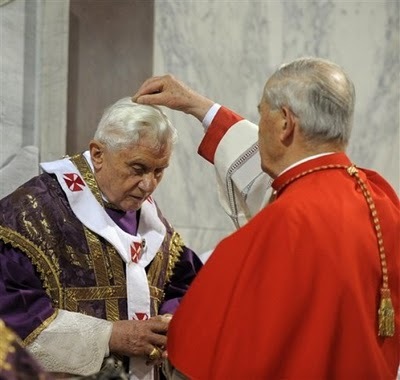 VATICAN CITY (CNS) — Wishing all Christians a “happy Lenten journey,” Pope Benedict XVI said fasting, almsgiving and prayer are traditionally suggested for Lent because they have proven to be effective tools for conversion. Lent is a time “to accept Christ’s invitation to renew our baptismal commitments” in order to arrive at Easter in a new and stronger state, the Pope said at his weekly general audience March 9, Ash Wednesday and the start of Lent for Latin-rite Catholics. “This Lenten journey that we are invited to follow is characterized in the Church’s tradition by certain practices: fasting, almsgiving and prayer,” he told the estimated 7,000 people gathered in the Vatican audience hall. “Fasting means abstaining from food, but includes other forms of self-denial to promote a more sober lifestyle. But that still isn’t the full meaning of fasting, which is the external sign of the internal reality of our commitment to abstain from evil with the help of God and to live the Gospel,” Pope Benedict said. In the Church’s tradition, he said, “fasting is tied closely to almsgiving” and is the sign that after having given up an attachment to things and to sin, the Christian has embraced good works. “Lent is also a privileged time for prayer,” the Pope said. He quoted St. Augustine, who described fasting and almsgiving as “the two wings of prayer,” because they are signs of humility and charity. “For this reason, during Lent, the Church invites us to be more faithful and intense in our prayer and to meditate at length on the word of God,” the Pope said. The Lenten period is the Church’s gift to Christians to help them prepare to truly celebrate Easter, Pope Benedict said. “In order to reach the light and joy of the resurrection, the victory of life, love and goodness, we, too, must take up our cross each day,” he said. In his homily during the Mass at Rome’s Basilica of Santa Sabina, the Pope said there is a risk that Lent is seen as a time of “sadness, of drabness,” when it really is “a precious gift of God, a time rich and full of meaning” for the Church and its members. In fact, he said, Jesus admonished his disciples not to moan and groan in public as they practiced their penance, because then the admiration they received would be their reward. Especially during Lent, Christians should be “a living message” of the joy and beauty of being saved by Christ because “in many cases we are the only Gospel that people today” will know, he said. “Here is another reason for living Lent well: to offer the witness of faith lived to a world in difficulty that needs to return to God, that needs conversion,” he said. Also March 9, the Vatican released Pope Benedict’s message for Brazilian Catholics’ Lenten solidarity campaign; the 2011 campaign focused on the relationship between environmental destruction and human selfishness. “The first step toward a correct relationship with the world around us,” the Pope said, is to recognize that human beings are creatures made by God. “Man is not God, but his image, so he should try to be more sensitive to the presence of God in what surrounds him: in all creatures and especially in other human beings,” the papal message said. In my article I didn’t dare speak of a “reform of the reform” because I know it is a subject that produces hives at its very mention. Let’s be honest, it is implied.